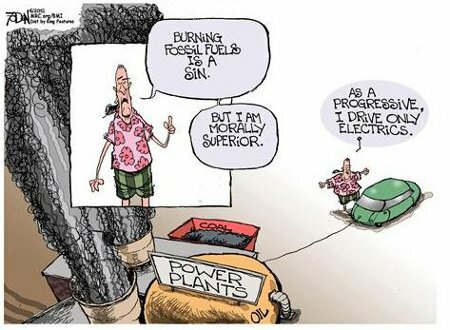 In the morality play that is the theater provided humanity by the Liberals and Progressives constant moralistic rantings and ravings it is the act that is their preaching about the evils of fossil fuel powered vehicles that is the most comic. But these self-righteous, ever-moralizing these eco-Leftists have baptized themselves in the “greenwash” and cannot see beyond themselves because to do so would tragically end their misplaced feelings of self-worth. The only true tragedy is that Americans have continued to allow these fools to have any sort of voice in shaping the course of America. The comedy is self-evident. This entry was posted on Saturday, February 11th, 2012 at 10:36 am and is filed under Humor, Society, The Environment. You can leave a response, or trackback from your own site. I have discussions with our Atheist friends and when it comes to religion, one tool they use is science. Anyone mired in religion, in their small minds, is anti science and anti progress. If you look at the green movement, they are anti science. They force totally inefficient energy technologies down the throats of the rest of us. They hate anything that allows modern life to exist. They delude themselves that they are not anti science with the argument that green technology is advanced, except they don’t care that it does not work as well as fossil fuels do. The Global Warming hoax is based on corrupted science. I accidentally came across the archetype anti progress group, the Luddites. It occurred to me that it is exactly what the ecoleftists are, green Luddites. In the latest edition of of National Review there is an article about natural gas fracking. It goes through the environmental, economic, and political aspects. There is more science and technology involved in fracking a gas well than I imagined. The fact that it has the potential to solve much of our energy problems means the green Luddites hate it as much as the pipeline our High Lord and Master Obama killed. This is why I tend to refer to the Warmists as cultists, Alan. They’re behavior has all or most of the earmarks of a cult. I don’t think the Luddite analogy fits though. The Warmists aren’t against technology. Indeed, quite the opposite. They’re Utopian technocrats blindly following junk science to promulgate un-working, and possibly unworkable, technologies. Frankly, so far as I can see, these eco-Leftists are more Leftist than Green. All of what they espouse seems based upon their hatred of Western capitalism and some of the major industries that make up its backbone. The “green” part of it seems little more than another vector for their Socialism. If you look at the modern energy era, post 1974 , our Democratic Presidents are quite unimpressive. Carter and Obama are arguably the two most personally ethical . I mean that in that they had no glaring scandals and yet they are utter failures as leaders. I’m not counting political lying. Ironically, the only objectively successful Democrat President was Bill and he was a perjurer and Philanderer. The other obvious connection of Barack and Jimmy is their support of Green energy. After the Obama era closes and hopefully after one or two Republican terms, I hope our next Democratic President is an oil loving, skin hound. Anything else will signal the end of the Republic. Pretty much, Alan, except that Carter was more focused on reducing dependance upon foreign oil than Green energy. He was actually a strong advocate for CNG which led to the fraking that the eco-Leftists are now complaining about. Like Obama though, he was pushing for technology that wasn’t supportable at that time so the end results look quiet similar. Fracking has a long history . Obama claims that government research gets the credit for fracking, which like everything President Bull$h!tter says is misleading. The man who deserves the credit for modern fracking is George Mitchell. He took the chances and bet his own money. Well yes, Alan. Obama claims that government research gets the credit for fracking because the government – many years ago – gave Mitchell and others grants and tax breaks to find more useable domestic energy sources. Of course he never admit that the government’s involvement was limited to deferring a fraction of the costs that the oil companies would incur doing such research when it was not yet commercially needed. As if the President had anything to do with that. They should report what the President has said over the years about the problem. Right now I am viewing Obama’s 2008 speech in Berea, OH when he said that we all should just properly inflate our tires. I am watching the cheering idiots behind him. I wonder, where are they now? Probably living in an OWS tent or in their parents basement.